Heat a non-stick skillet to medium-high heat. When hot, spray with non-stick cooking spray or add olive oil. Sauté chicken 3-4 minutes until no longer pink. 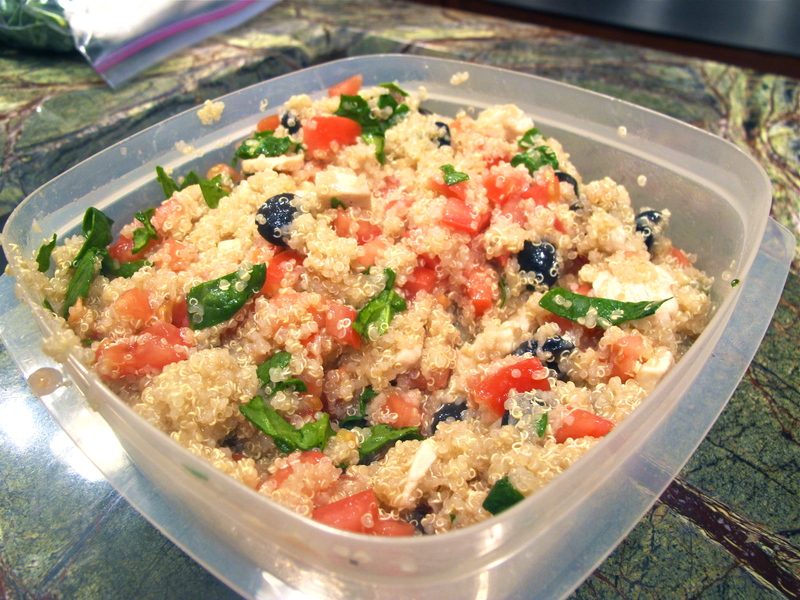 In a large bowl, add quinoa, chicken, tomatoes, feta, olives and spinach. Mix well. In a mason jar combine the vinegar, lemon juice, mustard, oregano, garlic, salt & pepper. Cover tightly with lid and shake. Add remaining ingredients (parmesan, olive oil & feta) to the jar, cover tightly and shake. Pour the dressing over the quinoa salad and mix well. Let sit in refrigerator overnight before serving to let the flavors mingle. This entry was posted in Appetizers & Sides, Chicken, Entrée, Mediterannean on January 11, 2014 by Miranda @ Tempest Books.